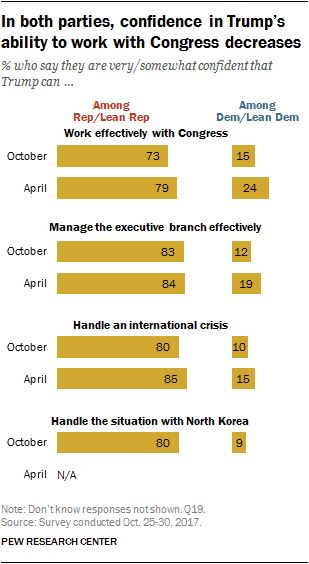 Growing numbers of Americans express little or no confidence in Donald Trump to handle an international crisis, manage the executive branch effectively and work effectively with Congress. And today, just 34% approve of Trump’s overall job performance, while 59% disapprove. However, Trump’s job approval rating is higher than those of Republican and Democratic congressional leaders. Just 22% approve of the way Republican congressional leaders are doing their jobs, down 12 percentage points since February. Job ratings for Democratic leaders are not quite as negative (29% approve), though also are lower than in February (37%). The new national survey by Pew Research Center, conducted Oct. 25-30 among 1,504 adults, finds that Trump’s job rating is lower than it was in June and February (39% on each occasion). Most Americans continue to have strong feelings about the president, with about twice as many strongly disapproving of his job performance as strongly approving (51% to 25%). Trump engenders less confidence in handling various aspects of his job than he did in April. As he prepares for his first presidential visit to Asia, 39% say they are very or somewhat confident in his ability to handle an international crisis, down from 48% six months ago. Six-in-ten say they are not too confident (14%) or not at all confident (45%) in Trump to handle an international crisis. The share expressing no confidence in Trump to handle an overseas crisis has increased seven percentage points (from 38%) since April. A similar pattern is seen in public confidence in Trump to manage the executive branch effectively and to work well with Congress. And just 39% say they are at least somewhat confident in Trump’s ability to handle the situation with North Korea; 13% not too confident and 46% are not at all confident in Trump in dealing with North Korea. 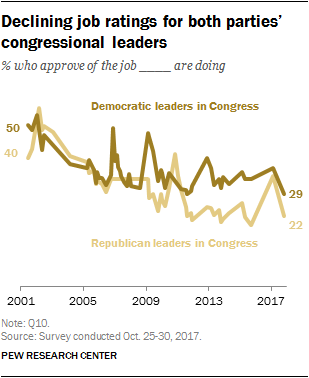 Since earlier this year, approval ratings for the congressional leaders of both parties have fallen – largely because fewer Republicans and Democrats are expressing positive views of their own parties’ leaders. In February, 34% of Americans, including 68% of Republicans and Republican-leaning independents, said they approved of the way GOP leaders in Congress were handling their jobs. Today, Republican leaders’ overall job approval has declined to 22%, with just 39% of Republicans approving of their job performance. Since February, job ratings for Democratic congressional leaders have fallen eight percentage points overall (from 37% to 29%); just 44% of Democrats and Democratic leaners approve of their party’s congressional leaners, down from 58% eight months ago. 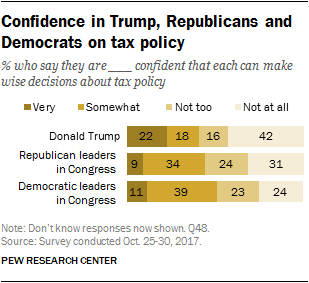 As Congress begins debate over taxes, the public expresses more confidence in Democratic congressional leaders than Republican leaders or President Trump to make wise decisions about tax policy. Overall, 50% say they are very or somewhat confident in Democratic leaders to make wise decisions about tax policy; 42% are very or somewhat confident in GOP leaders and 40% have the same level of confidence in Trump. As with his overall job rating, Trump engenders strong feelings on taxes: 42% are “not at all confident” that he can make wise decisions on taxes, which is much higher than the shares expressing no confidence in Republican leaders (31%) or Democratic leaders (24%). On the other hand, far more say they are “very confident” in Trump (22%) than say that about GOP leaders (9%) or Democratic leaders (11%). With the GOP’s tax proposal still taking shape, the public is divided on whether lowering taxes for corporations and large businesses would help (36%) or hurt (also 36%) the economy, with 25% saying it would not make a difference. However, far more Americans say lowering taxes for corporations would make the tax system less fair (44%) than make it more fair (25%); 27% say this would not make a difference. The new survey finds that public concerns about the nation’s budget deficit are lower today than during Barack Obama’s presidency. About half of Americans (54%) view the deficit as a “very serious” problem for the country, while 35% regard it as a “somewhat serious” problem. Very few, just 10%, think it is not much of a problem. In 2010 and 2011, close to 70% or more viewed the deficit as a very serious problem. In both parties, fewer say the deficit is a major problem than did so then. 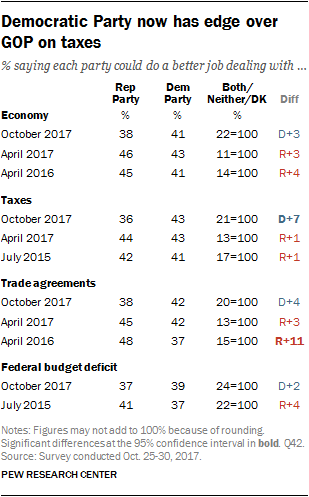 About half of Democrats (46%) now view the deficit as a very serious problem, down from 64% in late 2010. Over the same period, there has been a 25-percentage point decline in the share of Republicans saying the deficit is a very serious problem for the country (85% then, 60% now). The Democratic Party now holds a slight edge over the GOP on taxes and advantages on several other issues. Currently, 43% say the Democrats can better deal with taxes, while 36% prefer the Republican Party. In April, the two parties ran about even on taxes. The survey, which was completed before the Oct. 31 terrorist attack in New York City, finds that the public is divided over which party can do a better job of dealing with the terrorist threat in the U.S. (38% say the Democratic Party, while 37% say the Republican Party); another 12% volunteer that neither party could do better, while 9% say both could do about equally well. In recent years, the Republican Party has held a sizable lead on handling terrorism. In April, 48% preferred the Republicans, while 36% said the Democrats could do better. The two parties also run about even on several other major issues, including the budget deficit, the economy, trade and gun policy. As in the past, Democrats hold substantial advantages on the environment, health care and abortion. Most Republicans say Trump represents core GOP principles. Currently, 68% of Republicans and Republican leaners say Trump represents “the core principles and positions the Republican Party should stand for.” There has been very little change in these views over the past year. 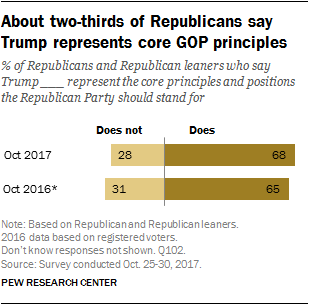 Last October, shortly before the election, 65% of Republican voters said Trump represented core Republican principles. Democrats more likely than Republicans to say their party is united. A majority of Democrats and Democratic leaners (56%) say their party is “mostly united,” which is little changed from April. By contrast, just 35% of Republicans and Republican leaners say the same about their party; six months ago, 42% of Republicans said their party was mostly united. Few expect progress on reducing deficit. The public is pessimistic that progress will be achieved in reducing the deficit. Currently, just 30% expect the nation to make “significant progress” in reducing the federal budget deficit over the next five years. In December 2012, somewhat more (44%) thought progress would be made in lowering the budget deficit. Overall, 34% say they approve of the way Trump is handling his job as president; a 59% majority disapprove of his job performance. Across most demographic groups, more say they disapprove than approve of Trump. Still, there are differences in these assessments by age, race and education. Overwhelming majorities of black (87%) and Hispanic (72%) Americans say they disapprove of Trump’s job performance. Among whites, 51% disapprove, while 43% approve. Majorities across all age categories disapprove of the way Trump is handling his job as president. Adults who are 50 and older (38%) are more likely to approve of Trump than those under 50 (30%). By more than two-to-one, those with postgraduate degrees (71% vs. 26%) and four-year college degrees (65% vs. 29%) are more likely to disapprove than approve of Trump. Smaller majorities of those with some college education (57%) or no more than a high school degree (55%) disapprove as well. White evangelical Protestants widely express approval of Trump: 67% approve, while just 27% disapprove. By contrast, a 58% majority of white mainline Protestants disapprove of Trump’s job performance, as do 59% of Catholics and 66% of those who are religiously unaffiliated. Public assessments of Donald Trump’s ability to handle several aspects of his job are more negative today than they were earlier in his term. Overall, 39% of the public is very or somewhat confident that Donald Trump can work effectively with Congress, while 59% are not too or not at all confident Trump can do this. In April, 46% expressed confidence in Trump’s ability to work with Congress. Trump receives similar ratings on his ability to manage the executive branch: 42% say they are at least somewhat confident that he can do this effectively. Last spring, half (50%) had confidence in Trump’s ability in this area. Today, 39% say they are very or somewhat confident in Trump’s ability to handle an international crisis, while 60% say they have little or no confidence. In April, 48% expressed at least some confidence in him in this area, while 51% said they had little or no confidence. Asked specifically about Trump’s ability to handle the situation with North Korea, more say they are not too or not at all confident in Trump (59%) than say they are at least somewhat confident (39%) in his ability to handle this issue. Confidence in Trump across issues has moved lower among both Republicans and Democrats, though Republicans continue to express largely positive assessments of Trump’s ability. Today, 73% of Republicans and Republican leaners are very or somewhat confident in Trump’s ability to work effectively with Congress, down somewhat from 79% in April. Similarly, 80% of Republicans are confident Trump can handle an international crisis; 85% said this in April. There has been no significant decline in Republican confidence in Trump to manage the executive branch effectively (83% say this today vs. 84% in April). The share of Republicans who express confidence in Trump to handle the situation with North Korea (80%) is comparable to the ratings he receives from Republicans on other issues (the item on North Korea was not asked in April). Among Democrats and Democratic leaners, very few have confidence in Trump’s ability across issue areas. Just 15% of Democrats today say they are confident Trump can work effectively with Congress, down from 24% in April. There have also been declines in the already small shares of Democrats who have confidence in Trump to manage the executive branch effectively (12% today, 19% in April) or handle an international crisis (10% today, 15% in April). Just 9% of Democrats say they are very or somewhat confident that Trump can handle the situation with North Korea. Well into Trump’s first year in office, most Republicans see the Republican Party as divided in its views on issues and vision for the future: Nearly two-thirds (63%) of Republicans and Republican leaners say the GOP is mostly divided, compared with about a third (35%) who say the party is mostly united. In April, Republicans were somewhat more likely to see the GOP as united in its views and vision (42%), though a majority still saw the party as divided (57%). By contrast, Democrats continue to see the Democratic Party as mostly united in its views on issues and vision for the future: 56% say this, compared with 39% who say the party is mostly divided. These views are unchanged from April. Approval ratings for both Republican and Democratic congressional leaders remain negative on balance and are lower than they were in February. Today, 29% say they approve of the job Democratic leaders in Congress are doing, down from 37% in February. Ratings for Republican leaders in Congress are even worse: just 22% say they approve of the job they are doing. Ratings for Republican leaders in Congress are down from a recent high point of 34%, reached in February at the start of the 115th Congress. The recent drop in ratings for both Republican and Democratic congressional leaders is largely attributable to partisans’ increasingly negative assessments of their own party’s leaders. About four-in-ten Republicans and Republican leaners (39%) say they approve of the job GOP leaders in Congress are doing. These ratings down sharply from February – just after the start of the new GOP-controlled Congress and Trump’s inauguration – when 68% said they approved. However, current Republican ratings of their party are on par with views at other points over the last several years. 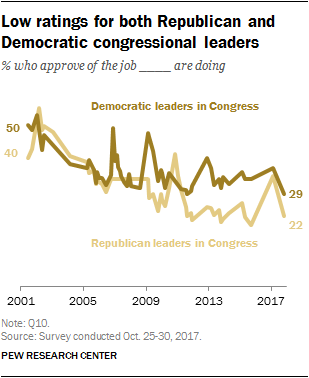 The share of Democrats and Democratic leaners who say they approve of the job Democratic leaders in Congress are doing is also down significantly from the start of the year. In the current survey, just 44% of Democrats say they approve of their congressional leaders, down from 58% in February. Democratic ratings of their leaders are as low as they have been in any survey since 2011. Which party could do the better job on key issues? On many issues – including dealing with the economy – the public remains divided over which party could do the better job. On other issues, including the environment, health care and abortion, the Democratic Party maintains long-held advantages over the Republican Party. And in a shift in public views, the Republican Party has lost ground on the issues of taxes and dealing with the terrorist threat at home. On many economic issues, neither party holds clear advantages and views are virtually unchanged from April. The public is split over which party could do a better job dealing with the economy, the federal budget deficit and trade agreements between the U.S. and other countries. On taxes, however, the Democratic Party currently has a slight advantage: 43% think the Democratic Party could do a better job on this issue, compared with 36% who say the Republican Party could do the better job. In April, public views were evenly divided. The share who thinks the GOP could do better on taxes has declined from earlier this year, while the share that prefers the Democratic Party is little changed (more now volunteer that they don’t know who would do better or say both parties or neither party could handle the issue). Today, 65% of Republicans and Republican leaners say the GOP could do better on taxes than the Democratic Party, down from 82% in April. The Republican Party also has lost ground on dealing with the terrorist threat at home – an issue where they have long held an advantage over the Democratic Party. About as many now say the Democratic Party (38%) as Republican Party (37%) could do the better job on the issue. In April, by 48% to 36% more said they preferred the Republican Party’s approach. The Democratic Party maintains a slight edge as the party seen as better able to deal with immigration. As in the past, the Democratic Party continues to hold advantages on the issues of health care, abortion and the environment. By 50% to 32%, more say the Democratic Party is better able to deal with health care. 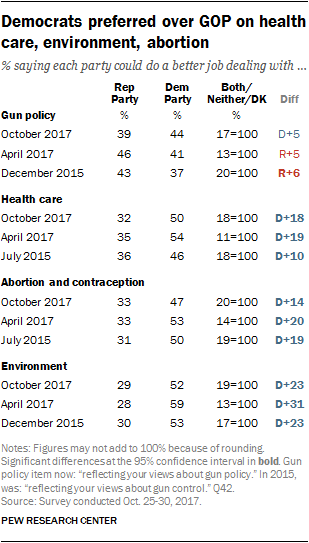 When it comes to policies on abortion and contraception, the Democratic Party holds a 14-percentage-point advantage over the Republican Party (47% vs. 33%). By a wide 23-percentage-point margin, more say the Democratic Party (52%) than Republican Party (29%) could do the better job dealing with the environment. Views on which party could better handle gun policy have fluctuated in recent years. Neither party has held a significant advantage in surveys conducted in April and October of this year. How fair is the federal tax system? About six-in-ten American (58%) now say the current federal tax system is either not too fair (32%) or not at all fair (26%). Significantly fewer (41%) describe the tax system as very fair (3%) or moderately fair (38%). 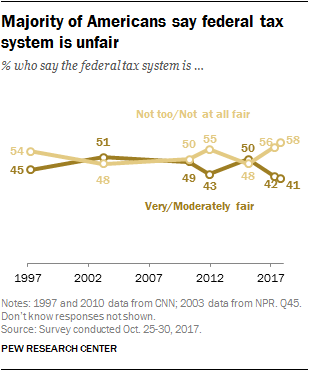 Views on the fairness of the tax system have changed little since April, but a greater share of the public now perceives the system as unfair than said this late in the Obama administration. In February 2015, about as many described the federal tax system as very or moderately fair (50%) as said it was not too or not at all fair (48%). 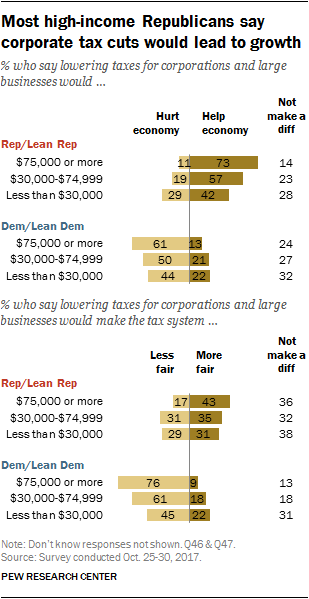 Republicans and Democrats hold similar views about the overall fairness of the tax system. Roughly four-in-ten Republicans and Republican leaners (43%) and Democrats and Democratic leaners (41%) describe the present system as very or moderately fair. Majorities of both groups say it is not too or not at all fair. 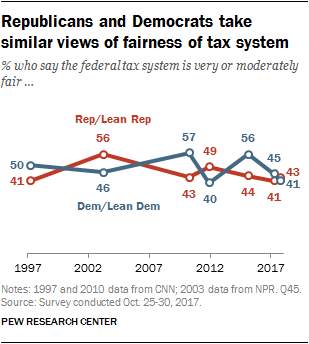 Partisan views of the fairness of the tax system have fluctuated in the last few decades, with Republicans and Democrats often holding different views. In 2015, Democrats (56%) were much more likely than Republicans (44%) to describe the tax system as at least moderately fair. By contrast, in December of 2011, a greater share of Republicans (49%) than Democrats (40%) described the system as fair. The public holds mixed views of how lowering taxes for large businesses and corporations would impact the economy; at the same time, more say these cuts would make the tax system less fair rather than more fair. Overall, 36% say lowering taxes for large businesses and corporations would help the economy, while an identical share (36%) say it would hurt the economy; 25% don’t think it would make much difference. Views on how these cuts would impact the fairness of the tax system tilt more negative: 44% say lowering taxes for large businesses and corporations would make the tax system less fair, compared with 25% who say it would make the system more fair and 27% who don’t think it would make much difference. There are wide partisan divides in views of the impact of corporate tax cuts. Six-in-ten Republicans and Republican leaners (60%) think lower tax rates for businesses and corporations would lead to economic growth. By contrast, 51% of Democrats and Democratic leaners think these changes would hurt the economy (just 19% think they would help). When it comes to the fairness of the tax system, 61% of Democrats (including 78% of liberal Democrats) say lowering taxes on businesses and corporations would make the tax system less fair. Views among Republicans are more mixed: 38% say these tax cuts would make the system more fair, compared with 35% who say they wouldn’t make much difference and just 23% who say they would make the system less fair. Those with higher family incomes are more likely than those with lower incomes to say lowering taxes on businesses and corporations would improve the economy. For example, 50% of those in households earning $150,000 a year or more think corporate tax cuts would help the economy, compared with just 27% of those earning $30,000 a year or less. Differences in views across income levels are more modest when it comes to the impact these tax cuts would have on the fairness of the tax system: Pluralities across most income groups say lowering taxes for large businesses and corporations would make the system less fair. Income differences in views of the impact of lowering taxes for businesses and corporations are evident within both parties. Among Republicans and Republican leaners, a wide majority of those with household incomes of $75,000 a year or more (73%) think lowering taxes on corporations and large businesses would help the economy. By comparison, 42% of Republicans in households making $30,000 a year or less think lower taxes for large businesses and corporations would help the economy. Among Democrats and Democratic leaners, the income pattern in views is the reverse: Those with higher incomes are more likely than those with lower incomes to say tax cuts for large businesses and corporations would hurt the economy. About six-in-ten Democrats with incomes of $75,000 a year or more (61%) think lowering taxes on corporations would hurt the economy, compared with 44% of those earning $30,000 a year or less. While Democrats overall think lower taxes on large businesses and corporations would make the tax system less fair, this view is more widely held among those earning $75,000 a year or more (76%) and those earning between $30,000 and $74,999 (61%) than among those with household incomes of less than $30,000 (45%). Among Republicans, those with incomes of $75,000 a year or above are more likely to say lowering taxes on large businesses and corporations would make the tax system more fair (43%) than less fair (17%). Views of how lowering taxes on large businesses and corporations would impact the economy are strongly associated with views of whether a decrease in corporate taxes would make the system more or less fair. Fully 73% of those who say lowering taxes would hurt the economy also say it would make the system less fair. Among those who say a decrease in corporate taxes would help the economy, about half (49%) say it would make the system more fair, while 30% say it would not have an impact on the system’s fairness and just 18% say it would make the system less fair. Overall, 40% of Americans are very or somewhat confident in Trump to make wise decisions about tax policy and roughly as many (42%) are very or somewhat confident in Republican congressional leaders. Half of the public (50%) is at least somewhat confident in Democratic congressional leaders on this issue. Yet the share who says they are very confident in Donald Trump (22%) is substantially higher than the shares saying this for either Republican leaders (9%) or Democratic leaders (11%) in Congress. But the public is also more likely to say they are “not at all confident” in Trump’s decision making on tax policy (42%) than to say this about either party’s leaders in Congress (31% say this about GOP leaders, 24% about Democratic leaders). Among Republicans and Republican-leaning independents, larger shares express confidence in Trump than Republican leaders in Congress: 81% say they are at least somewhat confident in Trump, including 52% who say they are very confident him. By comparison, 73% are at least somewhat confident in the party’s leaders in Congress, though just 20% say they are very confident in GOP congressional leaders. Democrats and Democratic leaners express roughly the same level of confidence in their party’s congressional leadership on this issue as Republicans do in GOP leadership: About three-quarters (74%) of Democrats are very or somewhat confident in Democratic leaders in Congress, including 19% who are very confident. Both parties express low levels of confidence in the opposing party’s congressional leadership on tax policy. About three-quarters of Republicans (76%) say they are not too or not at all confident in Democratic congressional leadership, while the same share of Democrats (76%) says this about GOP leaders. 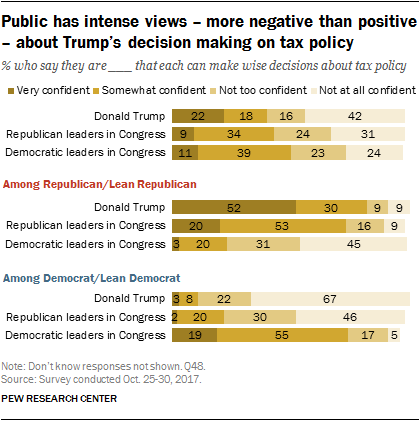 Yet Democrats are even less likely to express confidence in Trump: 89% have little or no confidence in Trump to make wise decisions about tax policy, including two-thirds (67%) who say they are not at all confident in him on this issue. 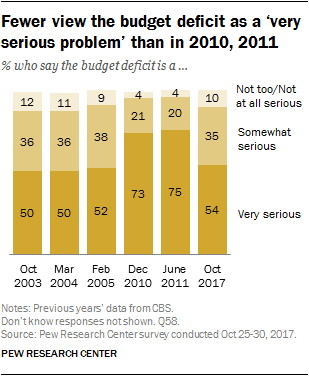 About half of Americans (54%) say the budget deficit is a very serious problem for the country right now; 35% say it is a somewhat serious problem, while 10% say it is a not too or not at all serious problem right now. 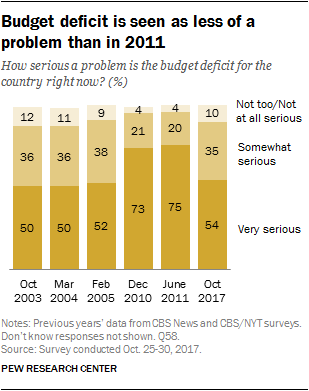 While this is similar to public opinion on this question in CBS News/New York Times surveys conducted in 2003, 2004 and 2005, far greater shares of Americans said the budget deficit was a serious problem for the country in 2010 and 2011. For example, in June 2011, 75% said the deficit was a very serious problem. Concern about the deficit is lower than it was in 2010 and 2011 across the political spectrum. 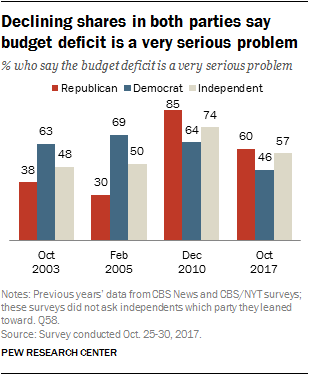 The share of Republicans, Democrats and independents saying the budget deficit is a very serious problem is down roughly 20 percentage points among each group from surveys conducted in those years. 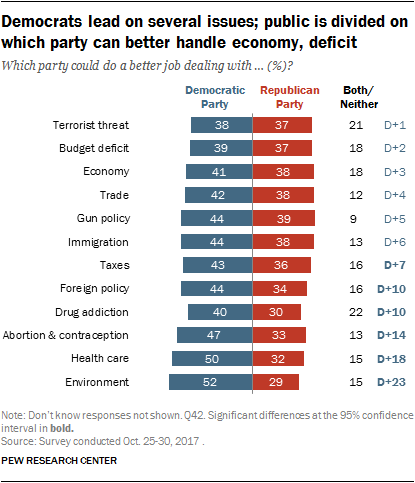 Republicans remain more likely than Democrats to say the deficit is a very serious problem: Today, 60% of Republicans, 57% of independents and 46% of Democrats say the deficit is a very serious problem. While a similar partisan gap was evident throughout 2010 and 2011, Democrats were more likely than Republicans to view the deficit as a serious problem for the country in surveys conducted from 2003 through 2004 (during the George W. Bush administration). Most Americans do not expect to see “significant progress reducing the federal budget deficit” over the next five years or so: 30% say significant progress will be made reducing the deficit, 66% say there will not be significant progress. Pessimism about making progress on the deficit is significantly higher than in surveys conducted from 2010 through 2012. In December 2012, 44% expected the country to make significant progress reducing the deficit in the following years. Democrats and Democratic leaners are much more pessimistic about progress on the deficit today than they were in 2012. Five years ago, 63% of Democrats thought there would be progress. Today just 18% of Democrats say this. 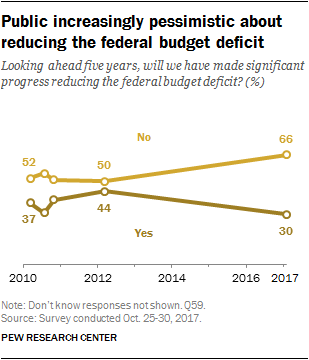 Republicans and Republican leaners, however, are more optimistic today than five years ago: 48% now say we will make significant progress reducing the federal budget deficit in the next five years; just 22% said this five years ago.